We plan to open our renewable energy plant during Winter 2018 when it will generate around 41MW of green electricity which is enough to supply 78,000 homes and save over 150,000 tons of CO2 every year. It’s difficult to visualise how much that is but would look the same as 250,000 really big hot air balloons and the saving is equal to 1.75 million plane flights to Paris. 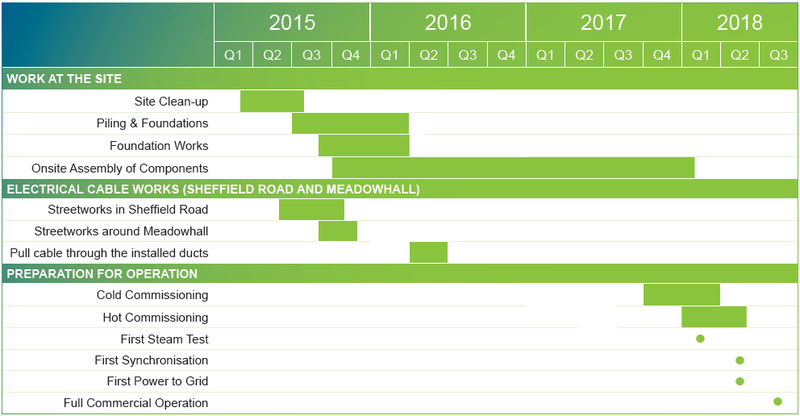 Before we can start generating electricity there are many stages we need to complete. Our first job was to complete the remediation and preparation of the site in order to lay the foundations for the power plant buildings, the largest of which will be the boiler house. Piling commenced at the end of July 2015 after which the concrete foundations were placed. Towards the end of 2015 the site started to rise from ground level as the power plant equipment, boiler, turbine, generator and gas clean up and the wood fuel store were built. 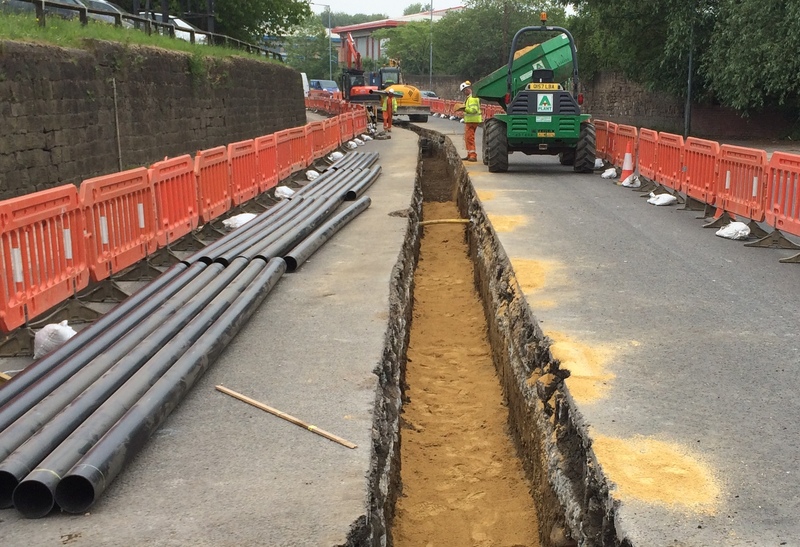 We also have now installed the cable that will carry the electricity generated to the national grid. This work started in June 2015 and was completed during 2016. Now everything is in place we are undertaking an extensive testing and commissioning process where we will go through everything to ensure the plant is in tip top shape and all the numerous safety features are working perfectly. We are then ready to generate first power and send our renewable energy to the national grid where it can be used across the UK. The route we are taking is approximately 2.8 miles long, leaving our site and joining the A6178 Sheffield Road at Ickles, it then travels westwards along Sheffield Road through Templeborough, past the Tata Steel works and the Magna Centre. It passes under the M1 Motorway, in a service duct, at Junction 34 (South) and continues along the A6178 before turning north westwards along Vulcan Road to join Meadowhall Way. 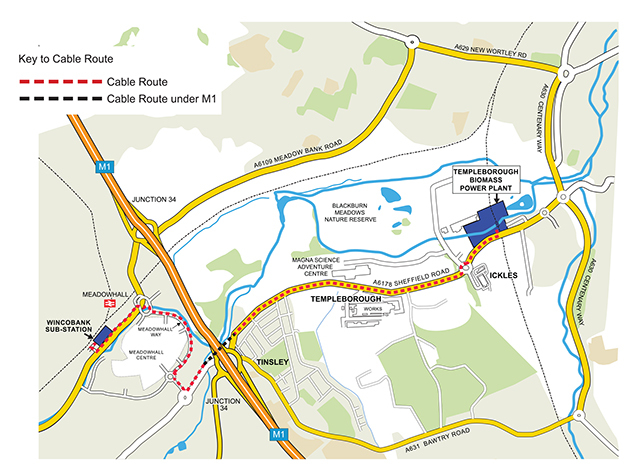 The cable heads around Meadowhall Way running northwards, eventually crossing the River Don and then travelling southwesterly along Meadowhall Road, the A6109, to join the Northern Power Grid electricity substation at Wincobank. The Templeborough Biomass Power Plant project continues to make great progress, not only has the skyline changed with the construction of the power plant, but now a new bridge has been installed across the River Don at the site. How much of the plant will be made locally? Altogether, these teams will employ 150-200 people during the construction programme and this list will be added to as the project progresses. All of which goes to show that even though this is a global project sourcing from where the best equipment and the best skills can be found, buying British is still the natural choice for a significant proportion of the project and local companies are a significant part of the story. In fact, to date the project has committed over £40m to the local supply chain and has bought British for over £65m of its budget. A high speed view from our time lapse cameras, during the main construction phase of the project. “This is our project and we believe that each person working on it deserves to come home from work every evening unharmed and together we share the commitment to make that happen by maintaining a safe site and looking out for each other’s safety”. Callidus Health and Safety is the Principal Designer for the project operating under the new UK Construction Design Management (CDM) regulations 2015. Throughout this process we will work closely with the Health and Safety Executive to make sure our project and all our team achieve the highest possible Health and Safety standards. For more information please take a look at www.hse.gov.uk/eet/ which provides a brief overview of HSE’s regulatory approach and the challenges faced by renewable energy industries. 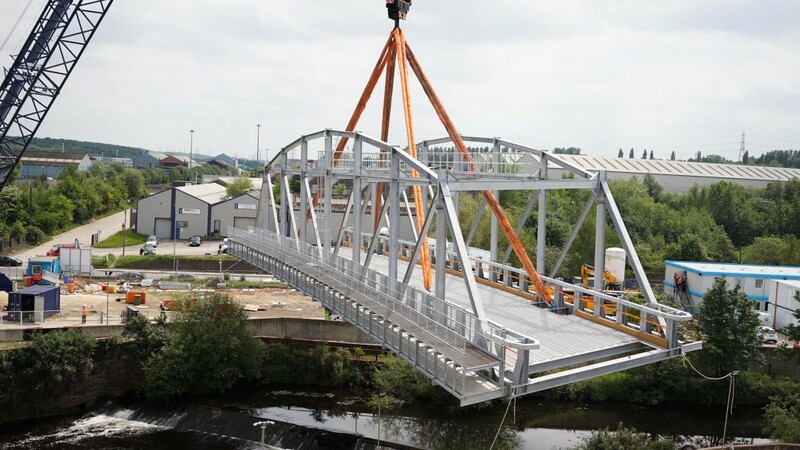 The project in its current configuration was granted planning permission on the 28 April 2014 by Rotherham Metropolitan Borough Council following consultation with the public and local stakeholders. The Environmental Permit was awarded by the Environment Agency on the 18 July 2014. The links below provide details of the initial consent granted in 2010 and the amended consent granted in April 2014. There have been further minor changes, discharge of conditions and non material amendments granted since April 2014 – please contact us for a full list. Construction and operation of a Biomass Energy Development incorporating two associated biomass combined heat and power (CHP) plants, two chimney stacks (30m and 40m in height) with a 200,000 tonne per annum wood pellet manufacturing process and associated infrastructure & landscaping works at former Firth Rixson Ickles Works Sheffield Road Templeborough Rotherham for Brite Partnership. Installation of a biomass energy development incorporating a 350,000 tpa wood pellet manufacturing process and an associated biomass combined heat & power (CHP) plant at Firth Rixson Ickles Works Sheffield Road Templeborough Rotherham.